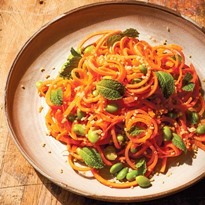 Chef Candice Kumai says you can spiralize your way to healthy glowing skin with her carrot noodles recipe. 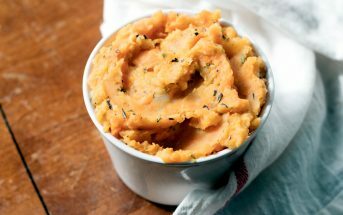 This side dish or light main is rich in antioxidants, and the carrots are a natural way to help our bodies produce vitamin A. The avocado also adds a boost of healthy fats, and the edamame balances out the protein and dairy-free calcium. This recipe with photo was shared with us by Nature’s Intent Vinegars. 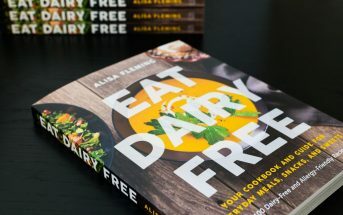 By ingredients, this recipe is dairy-free / non-dairy, egg-free, gluten-free, nut-free, peanut-free, optionally vegan, plant-based, and vegetarian. For soy-free sesame carrot noodles, you can omit the edamame or swap in your favorite soy-free, dairy-free protein. You can also substitute coconut aminos for the soy sauce. Coconut aminos are naturally much lower in sodium, so you don’t need to seek out a low-sodium version. And finally, you can use a soy-free, chickpea miso. 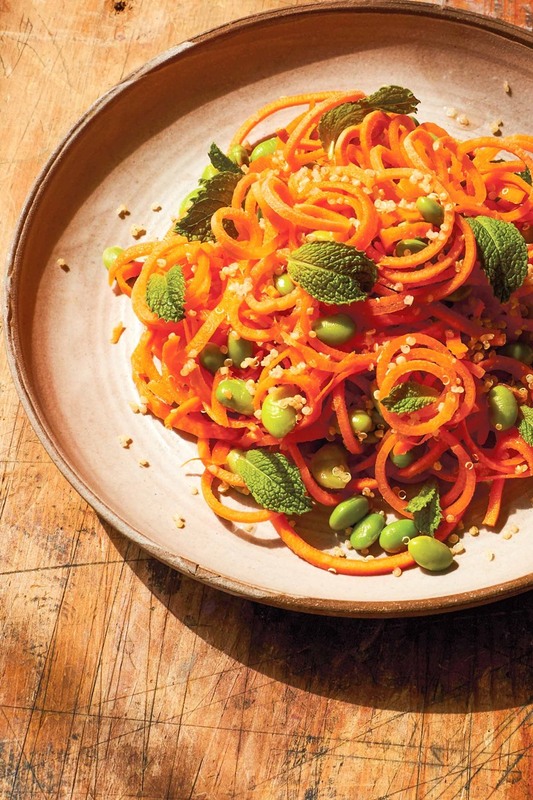 Candice calls these spiralized carrots "Beauty Noodles" because carrots contain antioxidants and beta carotene, which help support healthy skin. In a medium bowl, whisk together the rice vinegar, miso paste, apple cider vinegar, soy sauce or tamari, roasted sesame oil, honey, and ginger until well combined. Add the spiralized carrots, edamame, and cooked rice or quinoa. Toss well to coat. Garnish the salad with avocado cubes, fresh mint leaves and ground sesame seeds. This recipe was shared with Go Dairy Free by another recipe creator. We have not tested this recipe in our kitchens unless otherwise noted.